Activities in this section might well be termed sports card sociology. A sports card captures a moment within a specific popular culture that can be shared, viewed, and studied through time and space in the hands of different generations. These lead quite naturally into social and community studies. Using local newspapers, community bulletins, or district Internet directory, compile a short list of sports facilities or parks -- neighborhood or local or regional. * How many different sports are played in each location? * How many different organizations or leagues use these playing areas? 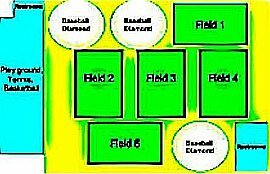 * Choose a sports field location close to you. How old is it? How did this area begin as a sporting venue? * Choose a league that plays there. * Choose one of the teams. * Besides the players, how many other people support the team as managers, trainers, etc.? * Design a sports card frame graphic for that team to use to announce its game schedule. What hobbies might be good for players who travel from city to city? What social and psychological advantages are there for teams to play “at home”? * What are the disadvantages for teams playing “on the road”? * How do coaches try to minimize those disadvantages so their teams perform well? Examine the front of some older trading cards. What kinds of popular social trends can you see? * Hair length or style? When you watch a sports activity, what community and socializing features add to your enjoyment of that activity or that venue ? The venue might range from a sandlot to a community recreation center to a sports complex or professional sports stadium. 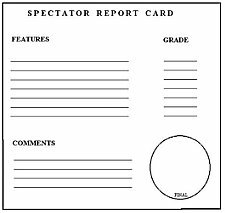 * Write a short explanation of each choice from your spectator point of view. * Rewrite this list as a report card on available features to evaluate the next activity you watch. Rate each feature and assign a grade. Share and defend your rating choices with classmates. Return from Teaching Sports Card Sociology to Sports Cards hub page for even more sports card teaching ideas! Want another class community activity? Check out the Community Menu Survey page to find another useful social survey idea! Return from Teaching Sports Card Sociology to Real World Content Advantage home page.